Yet another “no lost boot space” conversion, this time in 110. I bought this from a friend in the trade who had taken it in part-ex - it was an MoT write off with a failure sheet too small to list everything ! As it happened, it was a nice summer and I had some spare time, so it got repaired and, of course, gassed. The space for the petrol tank on these is slightly shorter than on a Range Rover, so the twin 40l tanks won’t fit - instead it has a 66l filled-centre toroidal tank plus a 36l sill tank. 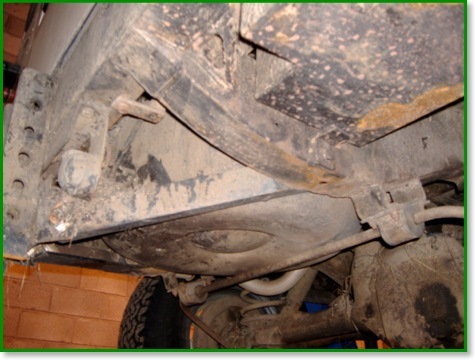 Again, the replacement petrol tank is in the offside rear wing and uses the original filler. It uses an AEB Leonardo closed loop control. Update: The old engine has just been removed, and I’m taking the opportunity to show photos of the mixer arrangement and throttle pot. Here you can see how I fitted the mixer into the intake before it splits into two - this avoids the problems of trying to balance the mixers in a two-mixer setup. 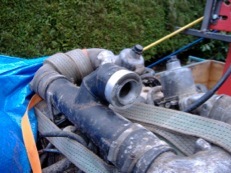 The downside is that there is a long intake pipe full of gas-air mix, which causes two problems. First, if you have a backfire, there is plenty of gas to go bang - it helps to leave the clips loose on the rubber pipe linking the U-bends to the T-pipe, so the U-bends can blow off and relieve the pressure ! Secondly, a closed loop system will hunt at idle because there is quite a delay between changes in gas flow reaching the cylinders. Here you can see the throttle pot I added. I’ve no idea what it came off as a mate gave me a selection he’d taken off some cars at a scrapyard he was working in at the time. This particular device is worked by a small lever which makes alignment less critical than one working directly off the end of the shaft - it’s operated by a 2BA screw you can just see poking out of the throttle spindle. 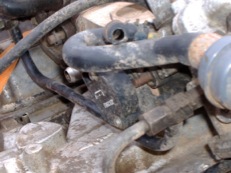 You may also just be able to make out the bracket fitted on the front two carb mounting studs.